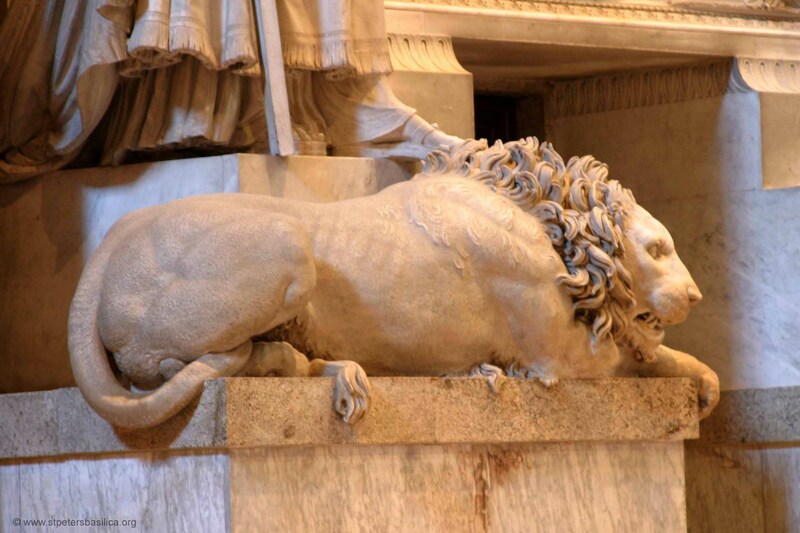 The monumental tomb of Clement XIII is by Antonio Canova, who worked on it from 1783 to 1792. 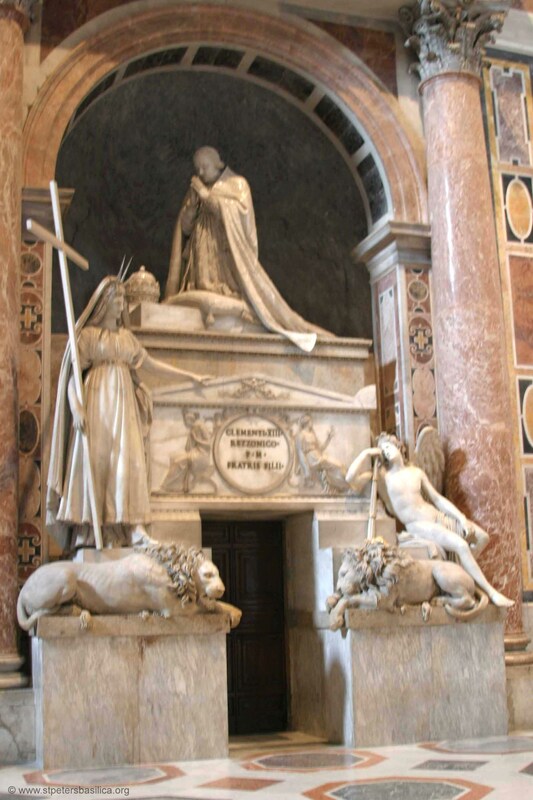 It shows the pope kneeling in prayer with the tiara beside him, and to the left of the sarcophagus Religion dressed in Jewish sacerdotal garments; to the right, there is a semi-reclining funerary Genius. 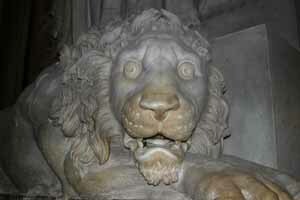 At the base are two crouching lions, one sleeping, the other vigilant. 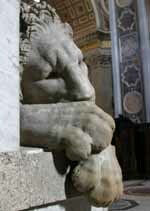 They are carved in travertine, while the rest of the monument is of white Carrara marble. Facing the altar is the Monument to Clement XIII, one of the masterpieces of the series, by Antonio Canova, who with it introduced neoclassicism into the Basilica. 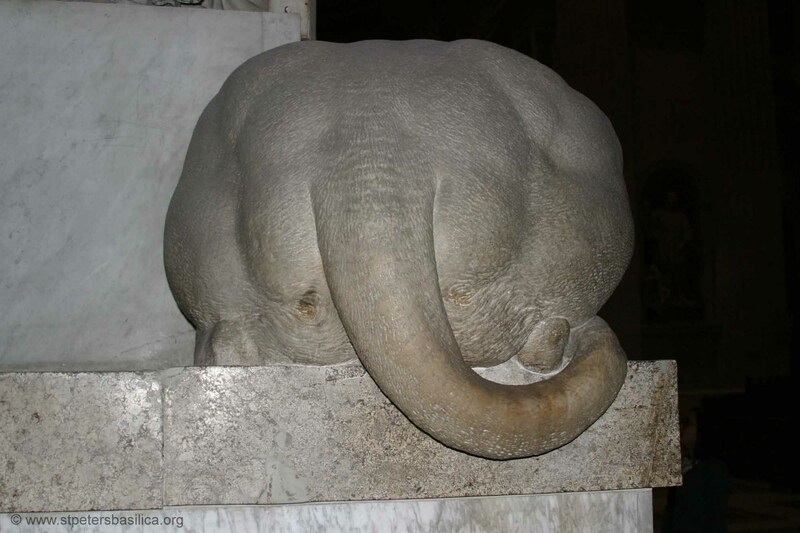 The general idea is in line with the new aesthetic tendencies in the purity of its planes and lines, accentuated by the use of white marble which produces an overall candor. 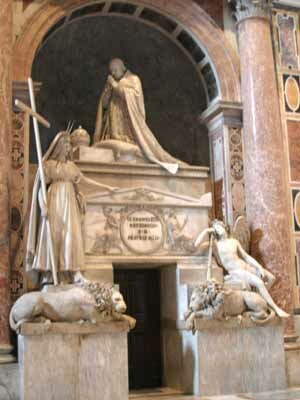 The Monument to Pope Clement XIII immediately appears quite innovative with respect to the previous examples in the Basilica, which are substantially based on the Bernini tombs, since it has greater spatial depth and eliminates the traditional feminine figures symbolizing the virtues, replacing them with pagan Allegories. The architectural-sculptural construction is rigidly Neoclassical, based on linearism and on a schematic volumetric relationship of the distinct support elements, in which the emptiness of the underlying door blends in quite harmoniously, and which here very convincingly simulates the entrance to a sepulchral tomb. 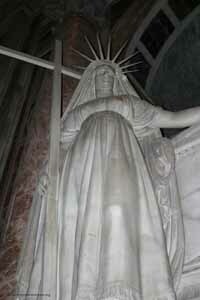 This rigid symmetry however does not generate excessive staticity or monotony because Canova, with simple ingeniousness, created a diversified solution of the various figurative elements, both at a sculptural and compositional level, structuring them over various planes and making the figure of the Pope, kneeling in a diagonal position, in front of the papal "Triregno" resting on a cushion, the epicenter of this dynamic assembly. 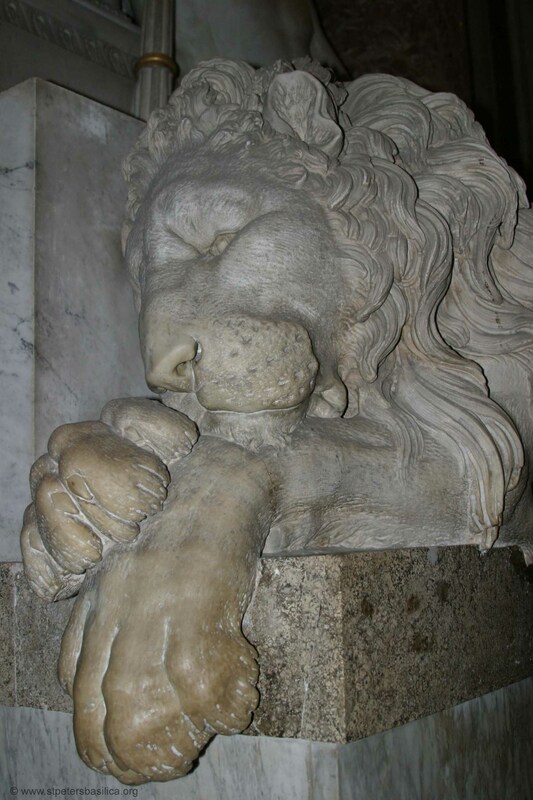 In addition to a spontaneous ability of making his essentially classical inspiration conform with Christian themes and subjects, Canova's inventive happiness is expressed in a perfect technical-interpretative symbiosis also with studies from real life, such as, in this case, for the Pope and for the lions. 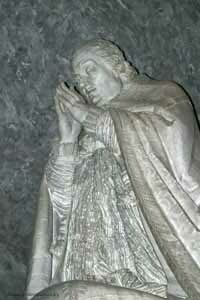 Heartfelt nobility emanates from the figure of Pope Clement XIII, the face bears a very close resemblance. 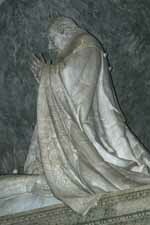 The Pope is kneeling rapt in prayer and completely wrapped by his sumptuous robe. 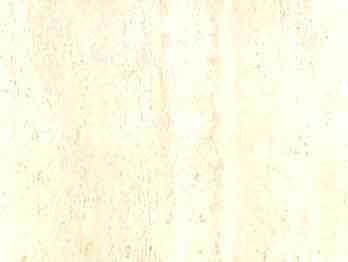 The severe personification of Religion, standing on the left, is the only element that has not been perfectly blended, also because of the excessive size of the cross. On the right the Spirit of Death, of Apollonian beauty, rests delicately, with the sickle upside down, on the sarcophagus, on which the figures of Charity and Hope, with reference to similar Greek-Roman works and executed with sophisticated delicateness, are sculpted in a bas-relief on the sides of the dedication. 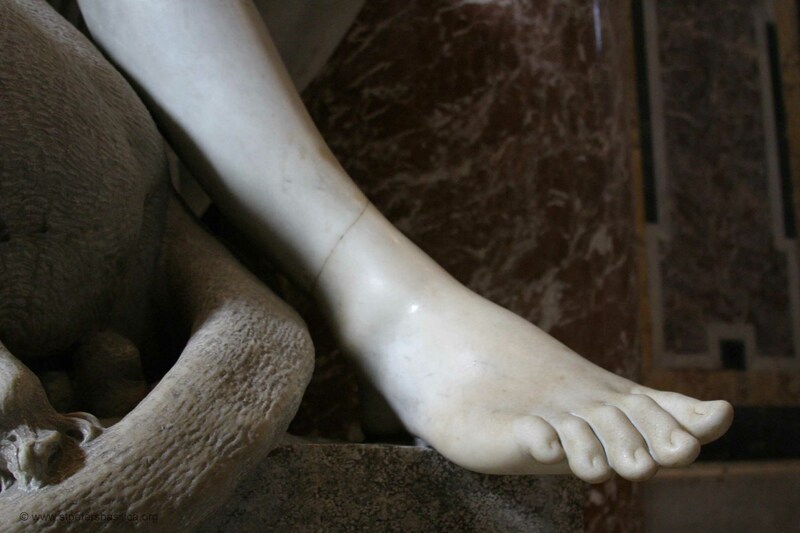 Canova personally created everything, preparing various studies and models (which are at present preserved in his birthplace of Possagno del Grappa). 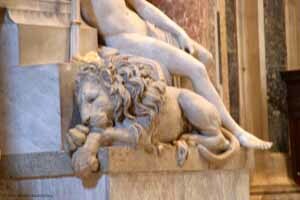 The two superb lions, among the most beautiful creations by Canova, crouch underneath. The one awake, on the left, represents the energetic work of the Pope while the one asleep, on the right, symbolizes his moderation. 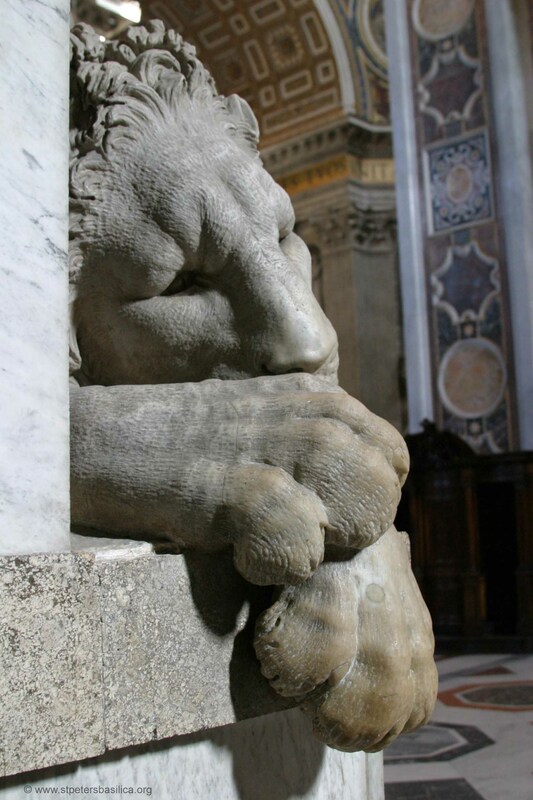 From an artistic point of view, this is undoubtedly one of the most valid monuments in the Basilica, if not the most spiritually and consistently inspired work. 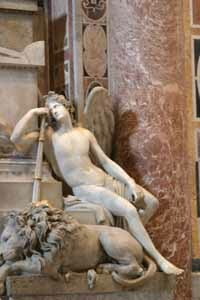 Unfortunately, none of those who continued after Canova knew how to attain his creative apex nor match his innovative spirit. 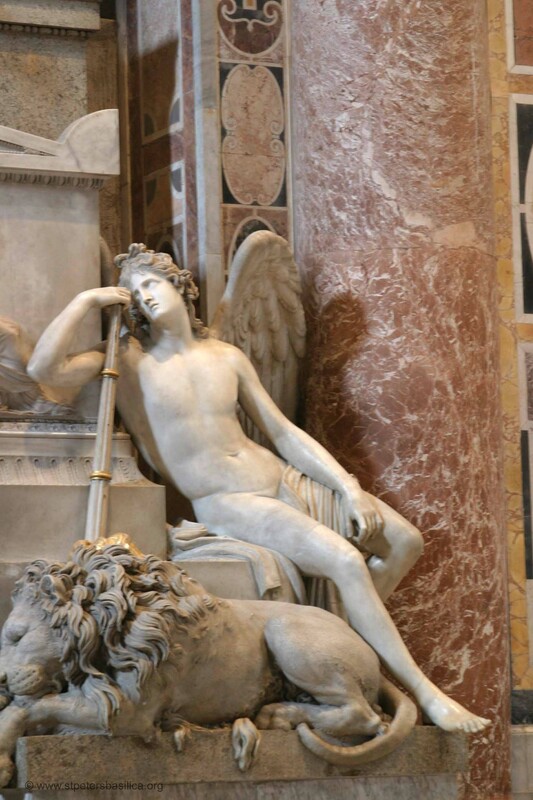 In fact, he undeniably left a strong impression on the artists who worked afterward in St. Peter's in the 19th century, but with results that were rather exterior and rhetorical with respect to their master. 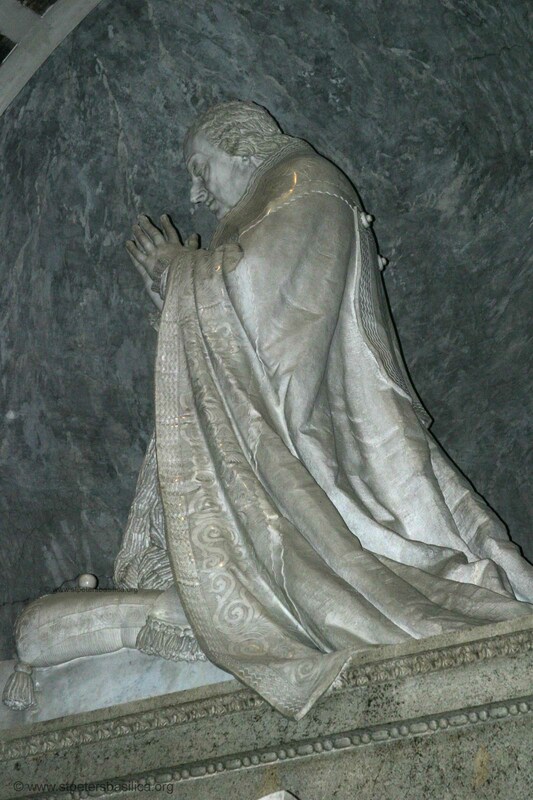 Clement XIII's pontificate was dominated by the issue of the Jesuits; he was under heavy pressure to suppress the order, but he died before a special consistory met. 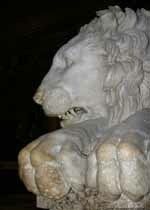 The Bourbons in France, Spain, Naples and Parma were now waging a full-scale offensive against the Jesuits. (At the time, the Jesuits had 23,000 members, 800 residences, 700 colleges, and 270 missions) Portugal's powerful minister, the Marquis de Pombal, hated the Jesuits...and confiscated Jesuit assets in Portugal and its colonies. France followed Portugal's lead. 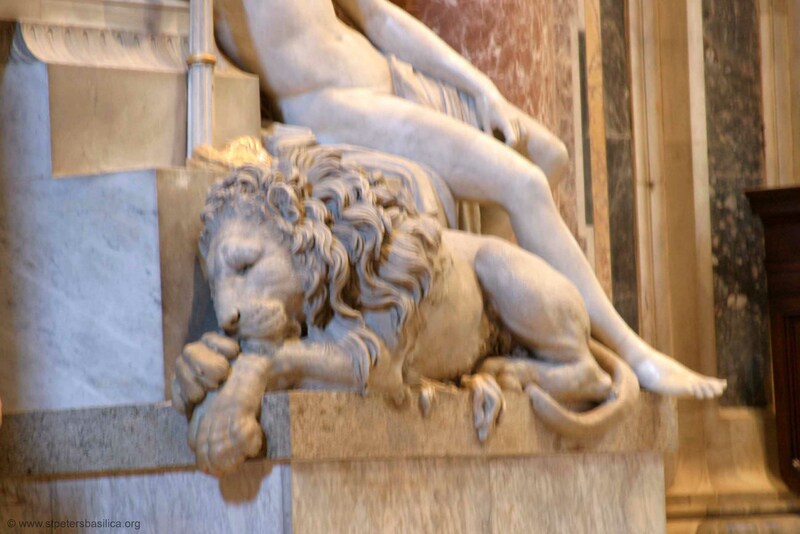 Although he supported the arts, he ordered the covering of certain nudities on statues and in paintings, including some of the frescoes in the Sistine Chapel. 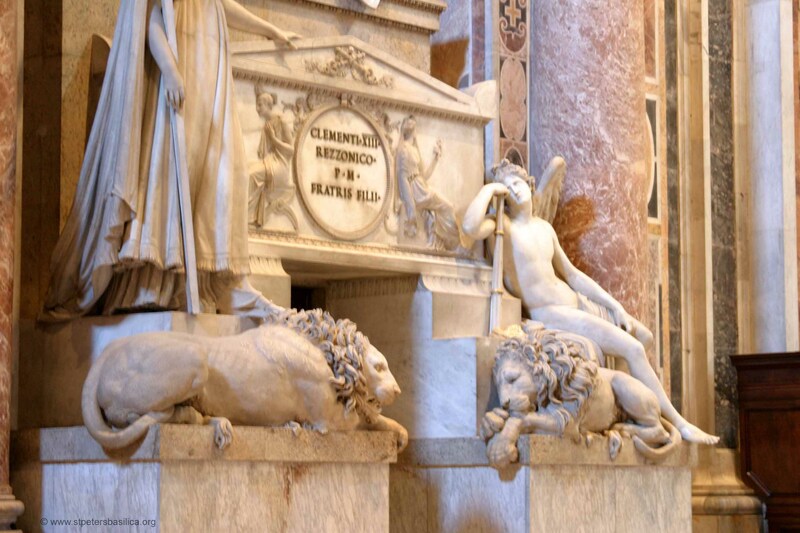 In the next area is the well-known monument to Clement XIII, one of the most celebrated works of Canova (1792), who introduced the neo-classical style into Saint Peter's with this work, as Bernini had introduced the baroque with his baldacchino. At the base of the monument are two lions: one is asleep, the other awake; the profound yet calm psychological contrast of the two is an example of technical perfection. Above, we see the sarcophagus with the statues of Religion and Genius, the latter, of an exact and coldly classical form, resembling a Christianized Apollo. The pyramidal construction - which fails to reach perfect stylistic or architectural unity - is completed by the figure of the kneeling Pope engrossed prayer. 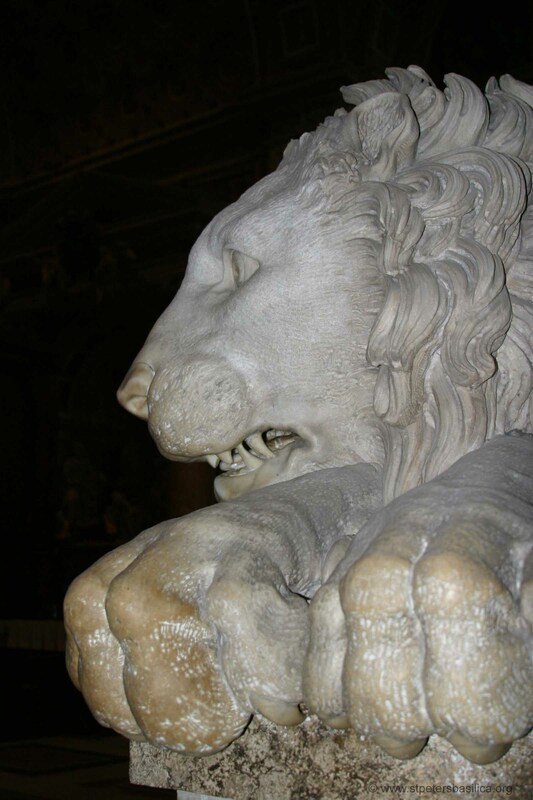 Died suddenly at age 75 from a heart attack which was hastened by stress concerning the decision to dissolve the Jesuits.His praecordia are in the Church of SS. 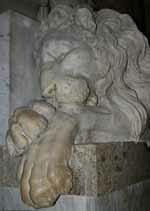 Vincenzo e Anastasio.